I flew out to Chicago at the end of August 2018, spending a week in the city before heading out to the suburbs for the Labor Day with my friends. I got in a few Coffee Spots while I was in Chicago, took a stroll around the city and went to Wrigley Field for a Cubs game. However, I was mostly there for work, staying at the Holiday Inn at Chicago Mart Plaza. The day after Labor Day, I hired the car in the picture and drove up the west shore of Lake Michigan, calling in at friends in Milwaukee, before exploring Door County, northeast of Green Bay. From there, I cut across to Minneapolis to spend the weekend with more friends, before embarking on an 8-day drive. I went up to Duluth at Lake Superior’s southwestern tip, drove the North Shore as far as Grand Marais, returned to Duluth, then headed east along the south shore of Lake Superior to Marquette. Cutting across to the north shore of Lake Michigan, I crossed over the Mackinac Bridge and down the east short of Lake Michigan to Traverse City. 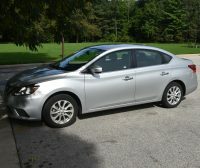 From there, I headed south to Grand Rapids, then around the southern tip of Lake Michigan and back to Chicago, dropping the car off two weeks after I’d picked it up. In all, I drove a shade over 2,500 miles in 14 days, more enough for a one-way trip from Chicago to Los Angeles. Alternatively, I could have driven to Florida and back! I spent a couple of days chilling out with my friends, then I flew back to London. The flights to and from Chicago are covered in the Travel Spots below, while you can also read about the Coffee Spots I visited in Chicago, and those I visited on the road trip. Header Image: sunset at Ephraim in Door County, Wisconsin, looking west towards Peninsular State Park and Green Bay. You can read about the trip in the following Travel Spot posts. This time last year I was preparing for the second of three flights to Chicago, which I took using a different combinations of airlines/routes, writing each up in its own Travel Spot. 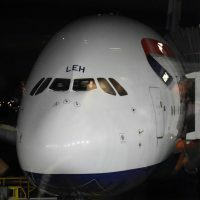 I’d originally thought that I’d be making the trip quite regularly, maybe four or five time a year, so part of my research was to work out the best airline/route. Assuming that I was starting from my Dad’s, I decided that by far the best option was flying direct from Manchester with American Airlines. However, circumstances change and this year, I’ve just got the one trip, departing on August 24th and returning four weeks later. So, while my research wasn’t completely wasted, it wasn’t as useful as I’d hoped. 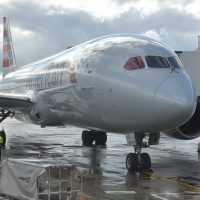 As suspected, I found myself flying from Manchester, so I booked my flight out on American, but, to my dismay, discovered that there weren’t any direct flights back, American discontinuing the route in early September. Instead I decided to cut my losses and, rather than returning to Manchester, I’ll be flying direct to Heathrow with British Airways. That, however, is another story, to be covered in its own Travel Spot. Today, I’m focusing on the flight out with American. If you are on Instagram, you can take a look at the following Instagram stories which have some pictures from the trip. You can read about all the Coffee Spots I visited in Chicago on this trip (listed alphabetically). Big Shoulders was not a name I’d really come across until about a year ago, since when it seems to have taken off. Founded nine years ago by Tim Coonan, who I had the pleasure of briefly meeting, Big Shoulders was originally a roaster, with Tim, who had a long career as a chef, roasting coffee in his garage. This grew to a wholesale roasting business and then came the coffee shops, currently standing at five. The Gold Coast branch opened in January, directly opposite Tempo Café, one of my favourite Chicago spots. So it made sense that on my return to the city, I would head first to Tempo for breakfast, then cross the road to try out the coffee at the new kids on the block. 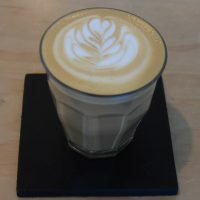 Big Shoulders has its house blend on espresso, with a fairly concise menu, including a cortado and two sizes of cappuccino and latte. There is a choice of two single-origins on filter, either bulk-brew (termed “fast drip” on the menu) or pour-over via the V60 (termed “slow coffee”, which I rather like). There’s the now-obligatory iced and nitro options, plus a selection of tea and a range of cakes if you’re hungry. Buzz Killer Espresso was the first place I visited on my returning to Chicago as part of my around the world trip in 2016. A lovely coffee shop/roaster just off North Milwaukee Avenue, it was set back from the street and spread over two floors, a delightful spot with excellent coffee and awesome staff. I was particularly disappointed when I learnt of its closure this time last year. However, all was not lost since Buzz Killer was moving, with a slight change of name, to new premises further up Milwaukee Avenue in Logan Square. Naturally on my return this year I hopped on the Blue Line and went straight there. Buzz Coffee Roaster & Baker is very different from its predecessor in terms of look and feel. Spread over a much larger single floor, the outside seating is gone and there’s a main entrance on Milwaukee and a second entrance at the back on Diversey. 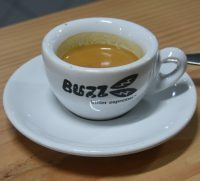 The coffee offering’s very similar though, with Buzz still roasting all its own coffee. 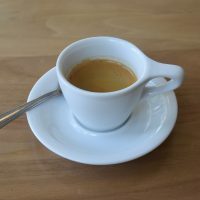 There’s a house-blend, single-origin and decaf on espresso, plus a blend and three seasonal single-origins on V60, while the bulk-brewer, that staple of the American coffee shop, is mercifully absent. 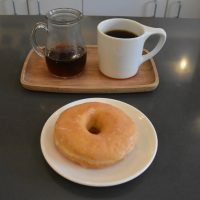 One of the more famous names in Chicago’s independent coffee scene, I can’t say exactly when or where I first heard of Gaslight Coffee Roasters, but it’s a name that keeps coming up when people talk about places to visit. 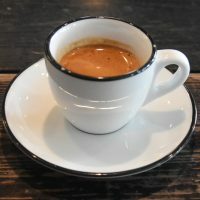 Like so much of Chicago’s speciality coffee, it’s on North Milwaukee Avenue between the Blue Line stops of Logan Square and California, the trains thundering close by Gaslight on the elevated section before disappearing underground at Logan Square. 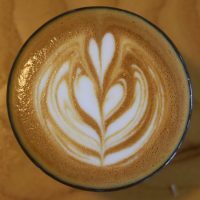 In terms of other speciality coffee shops, it neatly fills the gap between the cluster to the northwest (Logan Square), featuring the likes of Passion House Coffee Roasters and Intelligentsia, and the cluster to the southeast, starting with Ipsento/ Ipsento 606. Roaster, retailer and coffee shop all-in-one, Gaslight is rare in American speciality coffee circles in that it also has a full kitchen, serving five or six seasonal dishes until three o’clock each afternoon. This is supplemented by a day-long selection of cakes and pastries. Roasting takes place three times a week in a separate room to the rear of the store. 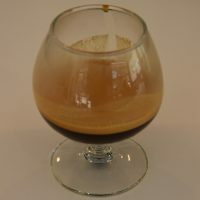 A small selection of single-origins is produced, which is rotated through espresso/batch-brew, with two single-origins on espresso and one on batch-brew. Good coffee in offices is something of a rarity, the odd exception such as Store Street Espresso in Sheldon Square notwithstanding. Therefore imagine my surprise on turning up at my office for the week and discovering, in the lobby, not a run-off-the-mill coffee bar, but a genuine multi-roaster in the shape of the Infuse Coffee & Tea Bar. Best of all? The building’s open to the public, so anyone can walk in for some great coffee. Infuse has a blend and decaf on espresso, plus two options on bulk-brew, using different roasters from all over the country. Cold brew and iced tea are on tap, plus there’s normal tea, matcha and chai lattes and a range of food from local suppliers. Even better, if you are planning on staying for a bit, Infuse will serve your coffee in a proper cup, while the lobby has seating plus free Wifi. January 2019: Infuse now uses Passion House Coffee Roasters on both espresso and batch-brew. Regular readers will know that I have a soft spot for Intelligentsia, the Chicago-based roaster/coffee shop chain with six branches in the city and others in Boston, New York and Los Angeles. 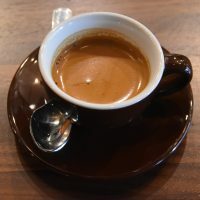 Some of my earliest speciality coffee experiences came in its branch in the Monadnock Building on Jackson Boulevard and, in many ways, it wouldn’t be a visit to Chicago without at least one coffee from Intelligentsia. Since I’ve been confined to my hotel on my current trip by the freezing temperatures (down to -30°C, so cold that even the coffee bar in the lobby was closed), I thought I would take us back to warmer times, when I popped into Intelligentsia’s Logan Square branch on my previous visit to Chicago in August last year. There’s the usual Intelligentsia offering, with a choice on espresso: the classic Black Cat blend, a seasonal single-origin and decaf, plus another single-origin on pour-over and a third through batch-brew. Unusually for speciality coffee, the pour-over is priced to reflect the extra effort required, coming in at twice the price of the batch-brew. If you don’t fancy coffee, there’s a good tea selection, plus, if you’re hungry, there’s a range of cakes and doughnuts. Passion House Coffee Roasters has been around and roasting coffee in Chicago for the last seven years, but it’s a name that I only discovered this time last year on my previous visit to Chicago, when I had Passion House’s coffee at Infuse Coffee & Tea Bar, the coffee bar in my office building. Then, earlier this year, I found Passion House in, of all places, Spitfire Coffee in New Orleans, literally at the other end (north-south) of the country. 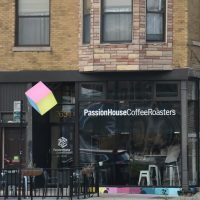 For most of its seven years, Passion House has made its name as a roaster, but in 2017 it opened its one and only coffee shop in Chicago right by Logan Square. 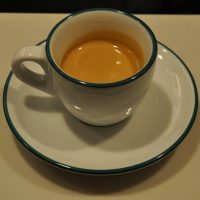 Occupying the ground floor of a long, narrow, old, two storey building, it’s a lovely spot, serving the house-blend, decaf and a single-origin on espresso, plus another house-blend on bulk-brew, with two-single origins on pour-over. Unusually for America, Passion House uses the Marco Beverage Systems SP9 in conjunction with the Fellow Stagg pour-over dripper. 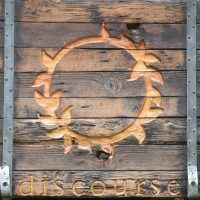 There are five loose-leaf teas, which can be had hot, cold or sparkling, while if you’re hungry, there are pastries, with doughnuts at the weekends, plus two quiches, one meat and one vegetarian. When I used to stay in downtown Chicago, my hotel was just around the corner from Tempo Café, an amazing 24-hour diner in Chicago’s Gold Coast (I say “used to stay”: it was all of three times!). However, I loved the place and made sure I visited for breakfast at least twice on each trip. Therefore, when I was back in Chicago as part of my coast-to-coast extravaganza last year, and unexpectedly found myself north of the river, I made a beeline to Tempo for a late brunch. Tempo, along with Boston’s Charlie's Sandwich Shoppe, is one of my favourite American diners, although compared to Charlie’s, it’s a very different place, slightly more upmarket in layout and feel, but still great value for money. All the usual diner staples are there, but you can also get full meals and everything is available 24-hours a day, seven days a week. Comfort food at its best! 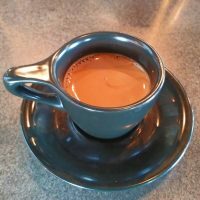 You can read about all the Coffee Spots I visited on my road trip around Lakes Michigan and Superior (listed alphabetically). Kickapoo Coffee is another of those Midwest coffee names that I became aware of when I spent some time in Madison last year, particularly from my visits to Bradbury's Coffee. 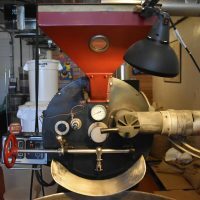 Based in Viroqua, Wisconsin, Kickapoo has been roasting there since 2005, with an emphasis on direct trade. This is its first coffee shop, which opened in 2015, with two more following, one in Viroqua itself and the other in Bayfield, on the shores of Lake Superior in northern Wisconsin. I’ve always enjoyed Kickapoo’s coffee, so since I was passing through Milwaukee, it was too good an opportunity to pass up. My Midwest road trip was planned primarily around the wonderful landscapes of Lakes Michigan and Superior. 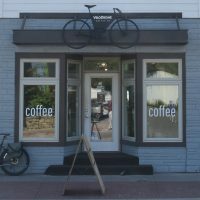 However, when deciding my route, I did take into account the availability of good coffee, Marquette, on Lake Superior's southern shore, being a prime example. Located roughly a day’s drive east of my previous stop, Duluth, and big enough to have a decent selection of cheap hotels, what swung it was Velodrome Coffee Co, whose presence I was alerted to by an article in Sprudge, written by friend of the Coffee Spot, The Pourover.